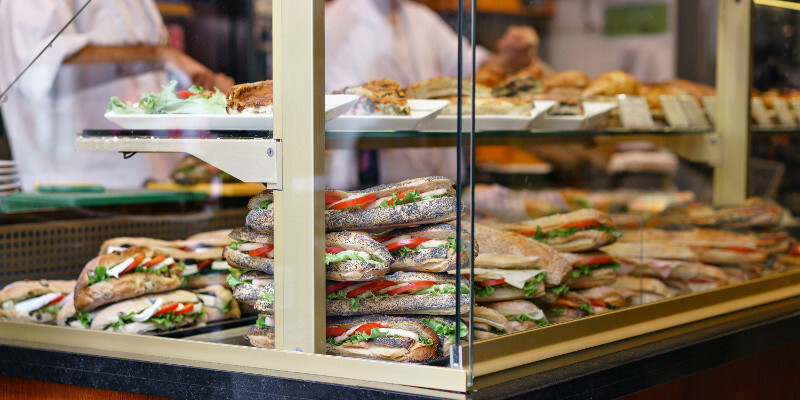 A new built-in technology helps bakery supplies and supermarkets with “to-go” products, such as sandwiches, by dosing the optimal quantity of spread. ViscoTec, guarantees a dosing accuracy of 99% (depending on the material), which in practice is often exceeded. Be it in the field of aviation or rail catering, or in daily bakery supplies and in supermarkets with “to-go” products: The demand for convenience food and especially for wraps or sandwiches is high. The production of bread rolls has become a major logistical and, above all, technical challenge. Automation plays an important role. A bottleneck and very time-consuming work stage in the production process is the application of spreads, such as cream cheese or butter, as an ingredient of the sandwiches. This mostly manual step can be automated in many applications to increase efficiency and production capacity. When dosing butter, it is important to dose the butter accurately in its spreadable form, i.e. not too hard in consistency, otherwise spreading is not possible and the bread becomes damaged. Even a liquid butter is not the solution – as warming it leads to a change in taste. When preparing cream cheese, pieces of the cheese mass are often mixed in. Herbs, garlic or pieces of pepper do not make it easier to automatically dose the spreads and apply them to the rolls or bread slices.